Elite Rewards is American Airlines’ incentive program for its elite flyers who go above and beyond their status qualification thresholds by offering them gifts such as high mileage bonuses, additional systemwide upgrades and the ability to gift elite status to friends and family among other benefits. 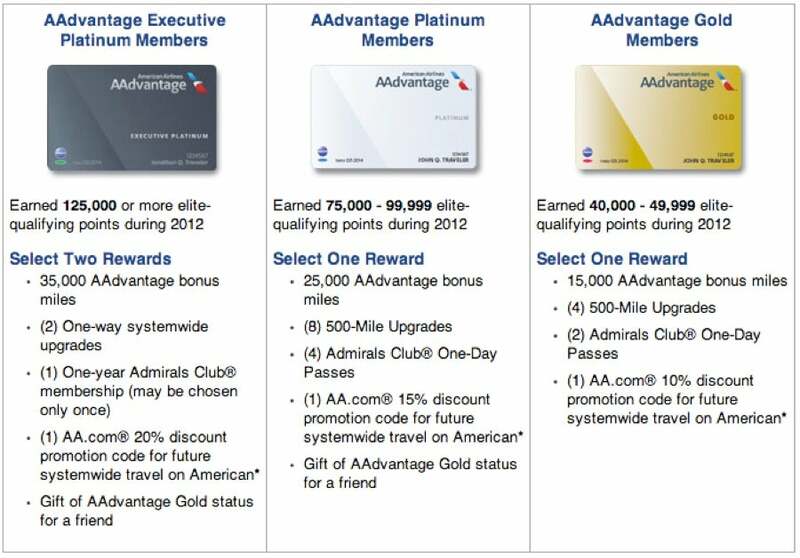 American has introduced a new system of Elite Rewards. In the past, you would just get your Elite Rewards at the end of the qualifying year based on the number of elite qualifying points you earned (more on that below), but now, American has just announced that it will be offering Elite Rewards throughout the year as flyers hit four successive thresholds, and more importantly, you can now qualify for Elite Rewards based on elite qualifying points, miles and segments, not just elite qualifying points as in the past! That will make it much easier to snag these perks. One of the huge changes here is in the qualification rules. Previously, you had to hit certain thresholds of elite qualifying points, making it much harder to earn Elite Rewards. The difference between an elite qualifying mile and point is that almost all fares earn 100% EQMs, however deeply discounted coach only earns .5 points per mile flown, normal coach 1 point per mile flown and full-fare/business/first is 1.5 points per mile. While most airlines just give an EQM bonus for full fare/business, American Airlines has a separate point system, which gets confusing. It favors full-fare and business travelers, but if you’re like the rest of us, your mileage balance could be huge but you might only be earning a fraction of the points. Now, however, it should be much easier to keep track of how close you are to qualifying for Elite Rewards because it’s tied to the EQMs and qualifying segments you fly, just like elite status. This is a major positive in my opinion that will make it easier for all of us to earn these benefits. The old Elite Rewards options. Beyond that, I like the fact that you can now earn these rewards as you hit the thresholds rather than having to wait until the end of the year, and that they are cumulative so that you can choose bonus miles at one threshold but systemwide upgrades at another rather than the old system in which you had to choose just one bonus (except at the highest level, where you got two). This means as an Executive Platinum with 100,000 Elite Qualifying Miles/ Points by year end you’d be able to select rewards from milestones 1 and 2: like 10,000 bonus miles (which I value at ~$180) and a systemwide upgrade ($500). Pretty lucrative! While most airlines don’t offer these lucrative type of awards for crossing elite thresholds, I do like Delta’s rollover elite miles that allow you to keep the MQMs beyond your achieved level of elite status you reach for a year into your qualifying activity for the next year. Just remember, to participate in Elite Rewards, you must register prior to December 31, 2013, and choose your reward by February 28, 2014. Use registration code ELTA3 to register. If you’ve already qualified for a milestone, look for your first notification email by the end of May. What do you think of the new Elite Rewards options and qualification rules? 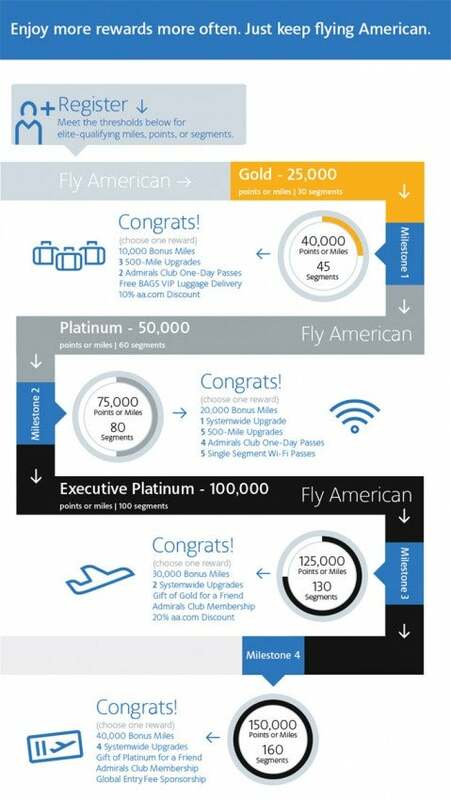 Will they keep you flying AA above and beyond qualifying for your status goal?